Regulation and public policy dictate many rules, relationships, and conditions that affect the deployment of distributed PV (DPV) systems. Policymakers and regulators may have discrete or overlapping roles when it comes to DPV, depending on the jurisdiction and context. Regulators and policymakers play important roles when it comes to DPV programs. Regulators govern the utility industry by setting standards (e.g. interconnection), determining revenues, calculating tariffs to recover costs, overseeing planning, and other conducting other activities that are intimately connected to DPV deployment. Policymakers, in turn, have multiple public policy tools available to target DPV barriers to adoption and enable market growth. In some cases, policymakers and regulators may have overlapping roles when it comes to DPV (see figure 1 below). Design a DPV compensation mechanism that clearly defines the value of self-consumed (if applicable) and exported DPV generation and takes into account the perspective of both the customer and the utility. Include a trigger, cap or some other mechanism in order to create the opportunity to re-evaluate a compensation mechanism which will allow policymakers to determine if any adjustments are warranted as the DPV market matures, costs decline, or analysis of DPV value streams become more detailed. If DPV compensation mechanisms change, apply the new policy to new customers and allow existing customers to comply with the original policy on which they based their DPV investment decision. Design and implement a clear interconnection process, standards, and codes that dictate how DPV systems can be connected safely, reliably, and expediently to the grid. Identify any market gaps (e.g. financing, skilled workforce, consumer awareness) that may need to be filled with a specific public policy intervention to jumpstart a DPV market. Create additional, appropriate financial incentives for DPV as needed. Include a trigger, cap or other opportunity to re-evaluate incentives and polices which will allow policymakers to determine if any adjustments are warranted as the DPV market matures and costs decline. 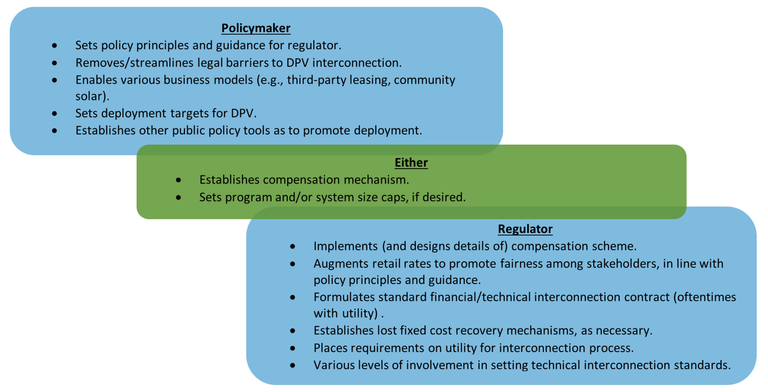 Consider the legalization of enabling policies such as virtual net metering or business models such as community solar and third-party leasing that can expand customer access to DPV by reducing both financing and site selection barriers. Evaluate alternative rate structures that both fairly compensate DPV customers for the value of their generation but also appropriately charge for grid services being used. Examples include time-of-use tariffs, minimum bills, and demand charges. Identify and address solar soft costs (i.e. non-hardware costs) that may be creating barriers to DPV deployment, including but not limited to, permitting, customer acquisition, inspection, interconnection, financing, and installation labor (e.g. installer licensing and certification). DG owners can be compensated in different ways for the electricity their systems generate. This short report defines compensation mechanisms for grid-connected, behind-the-meter DG systems as instruments that comprise three core elements: (1) metering & billing arrangements, (2) sell rate design, and (3) retail rate design. This report explores metering & billing arrangements (net energy metering (NEM); buy all, sell all; and net billing), with some limited discussion of sell rate design. New DG compensation mechanisms—such as value of solar and distributed locational marginal pricing—can offer additional value to generators while dampening the volatility of high DG penetration on the grid. Various pricing options, and policy options for protecting revenue adequacy for utilities are assessed in this report to provide readers with a variety of novel options to better compensate all stakeholders. As adoption of DG increases, demand for utility provided power decreases. This report assesses the impacts this decreased demand is likely to have on utility recovery of fixed costs, rate structures, and emphasizes best practices for DG regulation. Incentive programs credit DPV generators for their production and, in several U.S. states, have been successful at creating demand for DPV to meet targets. This report examines various incentive structures and recommends best practices. Some incentive structures are found to be contextually more applicable than others, and tools to align incentives with changing market conditions are discussed. Because ratepayers are usually funding incentives, methods to protect ratepayers and ensure cost-effectiveness are also discussed. Utilities looking for ways to incentivize DPV to meet targets or obligations can find value in this report. The 21st Century Power Partnership supports global power sector transformation. The Partnership has developed a curated, annotated resource library that provides reports, academic literature, case studies, and good practices to support DG regulation in a variety of power system contexts. The library is organized around several topical areas: ratemaking, understanding impacts, interconnection, alternative business and regulatory models, planning, and case studies. DG can play a role in sustainable, low-emission, climate-resilient development worldwide. This report identifies the benefits of DG deployment in development scenarios through energy access, greenhouse gas emission mitigation, and climate resilience as well as specific actions that may enhance or increase the likelihood of climate and development benefits. Additionally, several brief case-studies of DG deployment in developing communities are included. Value of solar is an emerging concept that provides a mechanism for utilities to compensate customers who generate their own electricity through DPV, based upon the cost-benefits to the power system. This report discusses program design options for Value of Solar tariff offerings and the impact of this type of tariff on future deployment of DPV. It also includes case studies from two jurisdictions in the United States (Austin, Texas and the state of Minnesota) that have adopted Value of Solar mechanisms. Value of solar methods for compensating DG rely on cost-benefit analysis to determine tariff options. This brief report analyzes different objectives behind DGPV programs, finding that various objectives require different methodological perspectives when conducting a cost-benefit analysis and ultimately creating a tariff. Estimating the benefits and costs of DPV helps power system stakeholders evaluate appropriate regulatory measures and compensation programs for DPV. To inform these decisions, this report describes current and potential future methods, data, and tools to estimate the benefits and costs of DPV from the utility or electricity-generation system perspective. Although the report is explicitly written in the context of informing estimation of DPV costs and benefits to the United States electricity system, it provides insights relevant to power systems around the world. Utilities worldwide are concerned about the financial impact of increasing DPV adoption among their retail customers. This report analyzes the impact of DPV deployment on distribution utility revenues and retail electricity tariffs in Thailand. It provides policymakers, utilities, and other energy practitioners a real-world example of how DPV affects certain stakeholders. Because of Jamaica’s high retail electricity prices, significant opportunity exists for DPV as an economic alternative. This paper reviews the effectiveness of Jamaica’s net billing pilot program, and identifies remaining challenges including a complex interconnection process, contractual ambiguity, and stakeholder equity concerns. The report provides several specific recommendations like shortening interconnection timelines, reducing caps on individual systems, and moving beyond a pilot phase. Many of these recommendations are applicable to other countries, particularly those with similarly high electricity rates. Recent market liberalization and energy sector reform in Mexico is pushing forward a wave of new potential for DG. This report explores how DG can fulfill many of Mexico’s energy goals. It presents specific policy options to better integrate DG as a cost-effective source of energy generation. Although specifically tailored to Mexico, many of the report’s recommendations can be applied in developing contexts. Informing Mexico’s Distributed Generation Policy with System Advisor Model (SAM) Analysis. English (PDF). Español (PDF). The Government of Mexico understands that distributed generation can contribute to meeting its greenhouse gas emissions reduction and clean energy targets. This report summarizes how analysis using NREL’s System Advisory Model (SAM) informed the government of Mexico’s distributed generation public policymaking process. Each case study within the report highlights important contextual background, the analysis process, results, and impacts.